The new Amazon Echo Plus 2nd Gen is smaller, but fatter. It is aesthetically pleasing and sounds much better than its predecessor. Amazon is playing big in the voice-based smart device league. By launching Eleven new Echo devices at its recent hardware event, Amazon has pretty much cemented its position in the smart speaker market. Among the crowd of Alexa-powered Echo devices was the Amazon Echo Plus (2nd Gen) smart speaker and hub. We received a White coloured unit of the Gen-2 Echo Plus (yes, you have colour options this time around) and got to work testing it in our labs. Off the bat, the new Echo Plus is a big leap from the tall and imposing Echo Plus of yesteryears. The older Echo Plus was hard to hide in plain sight and in contrast, the new Echo Plus blends in more seamlessly with its reduced footprint and new 360 degree fabric-based design. The Echo Plus 2nd Gen measures 148x 99 x 99 mm compared to the 235 x 84 x 84 mm Echo Plus 1st Gen. It is also lighter this time around, weighing around 780 grams. The speaker flaunts more curves this time around, making it more appealing for that kitchen countertop. Overall, I like the design language on the new Echo Plus, even though it seems to carry a tinge of influence from Google’s fabric-based Home smart speakers. 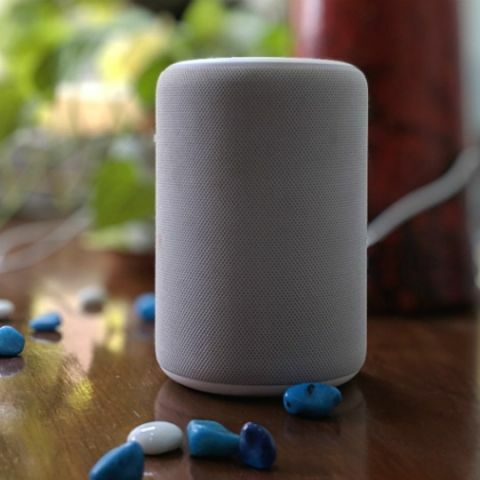 Although the fabric finish gives the speaker a good facelift, it could be problematic, especially in the white coloured variant, as the fabric does tend to attract stains and smudges. When it comes to button placement, you get the standard set of Volume Up/Down, Mute and Action buttons on the top of the speaker. These are surrounded by the Alexa light ring which turns Blue when the speaker hears the action word or when the action button is pressed. At the base is a tripod receptacle and a power port along with the threaded insert to connect third-party accessories. The bottom of the speaker houses a port for the power adapter and an Aux out to help connect with other speakers. As a speaker, Amazon has greatly improved the sound on the Echo Plus 2nd Gen. The 360-degree design with Dolby processing makes for more fuller playback. The speaker features a 3-inch neodymium woofer and 0.8-inch tweeter compared to the 2.5-inch woofer and 0.8-inch tweeter on the first gen Echo Plus. Sound from the new Echo Plus is richer in bass and crisper in general. 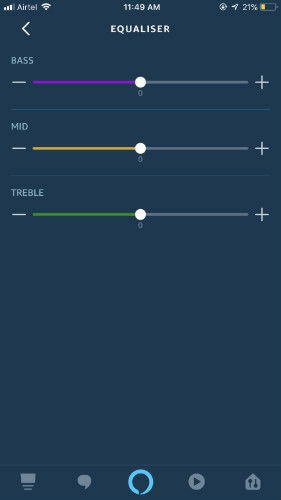 There’s also a basic Equalizer for the speaker on the Alexa app which will let you tinker the bass, mids and treble. Paired with the new Echo Sub, one can easily create a decent 2.1 setup using two Echo Plus devices. However, the price tag of the entire setup can get you a good set of studio monitors instead. I still feel the Alexa app could do with a better design. Even the equalizer is buried deep within the speaker’s settings and the app itself is pretty slow to navigate in general. A new feature on the Echo Plus 2nd Gen allows users to setup routines based on temperature. The speaker features a temperature sensor and can perform tasks like turning on the room AC in tandem with the indoor temperature. In terms of voice recognition, the new Echo Plus features 7 far-field microphones and can pretty much hear as good as its predecessor. All of Alexa’s skills are workable on the device, which also has an in-built Smart Home ZigBee hub. ZigBee is a very popular specification used by many smart home devices and allows them to connect with each other. On first impressions, I like the Echo Plus 2nd Gen not just for its Alexa smarts, but also individually as a bluetooth speaker. 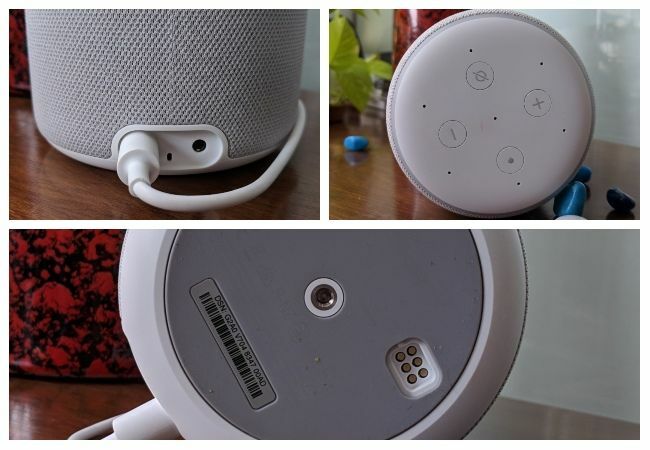 The obvious drawback when compared to other bluetooth speakers is that the speaker does not feature a battery and hence, is restricted to a single area. It is also not water or dust proof, which is disappointing considering that the sound is now at par with the UE Boom 2 which is my go-to bluetooth speaker. One thing Amazon did right was to price the new Echo Plus the same as the old one. But, instead of paying a full price of Rs 14,999, you can get the Echo Plus 2nd Gen for Rs 11,999 right now. We will put the Echo Plus 2nd Gen up for a more detailed review very soon, so stay tuned to find out if you should upgrade to the new speaker or stick to what you already have. Moto G 2nd gen RAM? Should I buy Moto G 2nd gen? Can you give the comparison between Asus Zenphone 5 and the New Moto G 2nd Gen? Moto G 2nd Gen or Xiomi Mi3?